Today we present a bright, nice, and unique free 3D screensaver. 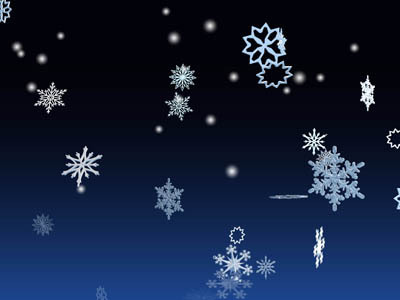 Enjoy winter and its holidays with 3D Winter Snowflakes Screensaver. You will see a lot of 3D snowflakes types that are falling with various speed and rotation. It randomly cover the screen of your desktop computer and continuously fall down. So it will really save the screen of your computer. Each snowflake melts if fly for a long time. At background there is animated gradient night sky. And of course moonlight adds some effects to the animated scene! Create a festive mood with excellent quality free winter screensaver for your desktop PC! Installation is very simple and takes just a few seconds. End User License Agreement (EULA). This document is a legal Agreement between you, the licensee and FullScreensavers.Com. Please read this Agreement carefully before installing the program. Downloading, installing and using this software you do not get any rights to intellectual property contained in the product, except for those rights which are given to you by this License Agreement.